With the occupation of a professional athlete comes the lifestyle, and with the lifestyle comes the realization that the place one calls "home" is subject to change at any given moment. For Danny Kristo of the American Hockey League's Hartford Wolf Pack, that realization came this past summer when he was traded by the Montreal Canadiens to the New York Rangers in the midst of preparing for his first NHL training camp. "I don't know what really took place, but I heard a bunch of rumors around draft time that I was maybe going to get traded, so I knew that it was a possibility," Kristo said. "It ended up not happening at the draft, but then two days later I got traded to New York." Originally selected by the Canadiens in the second round (No. 56) of the 2008 NHL Draft out of the U.S. National Team Development Program, Kristo played collegiately for four seasons at the University of North Dakota. He made his pro debut with the Hamilton Bulldogs, Montreal's AHL affiliate, at the conclusion of his senior season, scoring three points in nine appearances with the club this past spring. Despite being dealt to the Rangers just a few months shy of his rookie year, the 5-foot-11 forward embraced the move with the conviction of a true professional. "It was pretty cool to get traded to an organization like New York, especially to go from one Original Six team to another," Kristo said. "It was exciting and a little bit of a crazy time in my life -- I'm talking to everyone on the phone, everyone's texting me and I'm doing interviews and things like that. "Things [eventually] settled down and then I finally got to come out to New York for training camp, where I got my feet wet pretty good." Kristo was assigned to Hartford prior to the start of the season, and it's there that he has continued to develop under the direction of the Wolf Pack's coach, AHL Hall of Fame member Ken Gernander. "Danny obviously had some pretty good success at the collegiate level and in a handful of games with Hamilton last year," said Gernander, who captained the Rangers' AHL affiliates in Binghamton and Hartford for 10 years before moving behind the Wolf Pack bench, first as an assistant coach and now as head coach since 2007. "He's been the catalyst of a lot of our offensive plays and has been a pretty important part of our team thus far." The 23-year-old right wing's significance to his team can be attributed to his unique offensive capabilities, according to his coach. His 10 goals in 19 games this season lead all Wolf Pack skaters, and he is tied for first on the club in points with 17. "As far as purely scoring goals, he's got a very good release on his shot," Gernander said. "It's quick and he's able to disguise it by changing his release angle. It's hard for goalies to pick up on coming off his stick. "Offensively, he has a very good vision and he makes real creative passes -- it's not always just your run-of-the-mill ‘move it to the first available open guy.'" Kristo credits his new organization for the on-ice opportunities he's been able to create. "It's been a little bit of an adjustment from college to the AHL, but I feel like I've been doing a good job and it's been nice [here in Hartford] with the organization and my coaching staff," Kristo said. "They've given me the opportunity to be in some important roles and to play big minutes on the power play. Obviously, it helps when you're an offensive guy to play with good players and have that confidence." Perhaps one of Kristo's most notable teammates is fellow forward J.T. 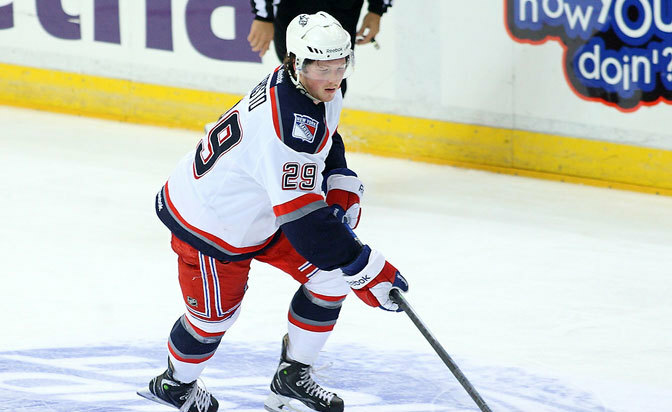 Miller, who has split this season between the Wolf Pack and the Rangers. The two have played alongside each other on Hartford's top line. "We play a pretty similar style game, and I think we kind of can think the game alike," Kristo said of Miller. "He goes to the hard places on the rink that make you successful. "[J.T. has] a really good head for the game and he plays hard, so I think we can almost work off each other and feed off of each other. We're getting some good chemistry going right now together -- it's been a good start so far with him and hopefully we can just keep it going." Gernander realizes the potential advantages the young players on his roster may gain from playing alongside teammates with NHL experience. "I certainly think that if they get to know and play with [guys who have played in the NHL], and maybe even talk to them about some of the things they worked through at the AHL level before they were able to make that jump to the NHL … the more interaction they can have with current NHLers is beneficial to these guys -- to see that a lot of times, the best path to the NHL is through the American league. The benefits that can be derived from playing in this league are all good experiences." For the Eden Prairie, Minn., native, his teammates aren't the only ones who have shown him what it takes to make the jump to the NHL. Like Kristo, Gernander is a Minnesota native and former college standout himself. "Coach has really helped me with the adjustment," Kristo said. "Obviously, his goal for me is to get me moved up to New York. Some little things that I can get away with down here, he shows me on video and tells me, ‘You need to do this better.' We'll work on stuff like that in practice -- he's been very patient with me and he's helped me a lot so far." Gernander is confident that with continued hard work, Kristo can round out his overall game and maintain NHL-caliber skills on both sides of the puck. "I think when he's on his game, the things he brings to the table offensively are probably NHL-worthy right now -- but that's only one side of the game," Gernander said. "He's got to learn the defensive side, squeeze some of the mistakes out of his game and do all the little things away from the puck before he's going to be someone that's challenging for a full-time job in the NHL." Showing an advanced sense of maturity for a rookie, Kristo recognizes the progression in his game so far and the changes that are still in process. "When you move up levels, the players are better and better, so you have to be better in your D-zone and you can't give away pucks," Kristo said. "I'm a guy that likes to make plays, and it's been a little bit of an adjustment, not trying to make the perfect play every time but just trying to make the right play -- being a little more simple." Kristo's successes as a first-year pro are paving the way for a lucrative career in hockey, according to his coach. "He's gotten off to a great start and he's become one of our offensive leaders," Gernander said. "That's pretty good given the fact that he's a rookie; it's not like he's been in the league for five or six years, this is right out of the box." It's all part of the AHL's learning process that has become crucial for many NHL prospects. "I think that's a pretty big responsibility too," Gernander said. "That's part of his process of maturation here: learning to deal with [being a leader], to be accountable or to be the go-to guy night in and night out. "Now that he's probably drawing a bit more attention from the opposition, he's going to have to find ways to continue to have offensive success and to make a name for himself that way as well."